To some, art and science are opposed to one another. Art is aesthetics, expression, and intuition, while science is all cold, hard, rational thought. But that’s a simplistic understanding. They’re both quintessential human endeavours, and they’re both part of the human spirit. Some at NASA have always understood this, and there’s actually an interesting, collaborative history between NASA and the art world, that reaches back several decades. Not the kind of art that you see hanging in elite galleries in the world’s large cities, but the kind of art that documents achievements in space exploration, and that helps us envision what our future could be. Back in 1962, when NASA was 4 years old, NASA administrator James Webb put the wheels in motion for a collaboration between NASA and American artists. 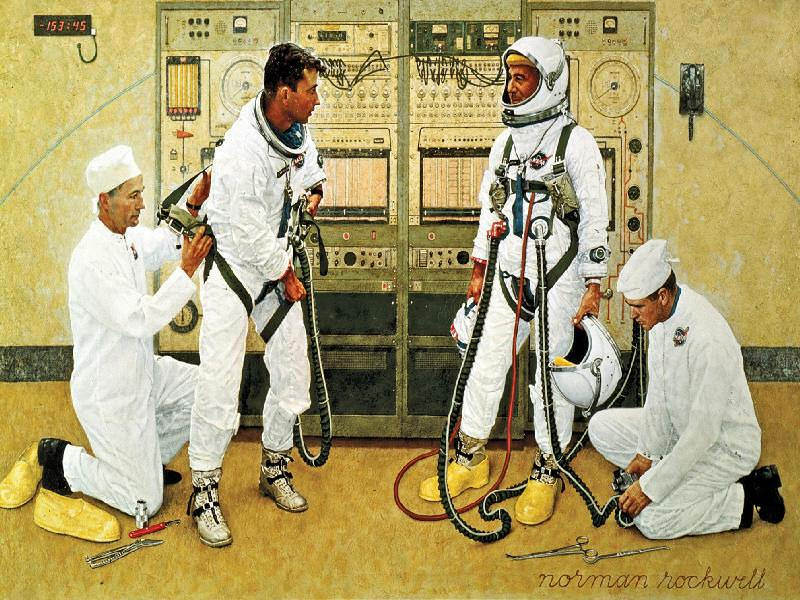 Artist Bruce Stevenson had been commissioned to produce a portrait of Alan Shepard. Shepard, of course, was the first American in space. He piloted the first Project Mercury flight, MR-3, in 1961. When Webb saw it, he got a bright idea. 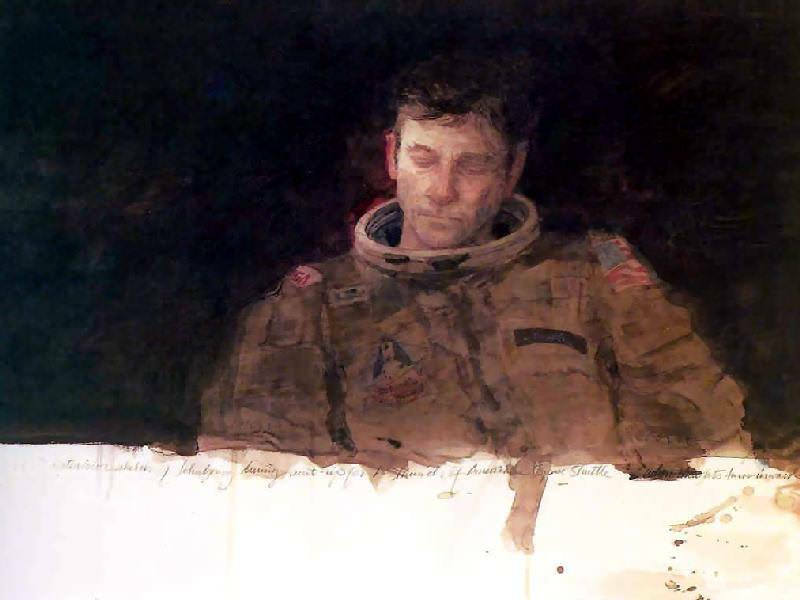 When Stevenson brought is portrait of Shepard to NASA headquarters, James Webb thought that Stevenson wanted to paint portraits of all seven Mercury astronauts. But Webb thought a group portrait would be even better. The group portrait was never produced, but it got Webb thinking. In a memo, he said “…we should consider in a deliberate way just what NASA should do in the field of fine arts to commemorate the …historic events” of the American space program. That set in motion a framework that exists to this day. Beyond just portraits, Webb wanted artists to produce paintings that would convey the excitement around the entire endeavour of space flight, and what the deeper meaning behind it might be. He wanted artists to capture all of the excitement around the preparation and countdown for launches, and activities in space. That’s when the NASA collaboration with artists began. A young artist named James Dean was assigned to the program, and he took a page out of the Air Force’s book, which established its own art program in 1954. There’s a whole cast of characters involved, each one contributing to the success of the program. One such person was John Walker, Director of the National Gallery. He was enthusiastic, saying in a talk in 1965 that “the present space exploration effort by the United States will probably rank among the more important events in the history of mankind.” History has certainly proven those words to be true. And that’s what they did. Artists like Norman Rockwell, Andy Warhol, Peter Hurd, Annie Liebowitz, Robert Rauschenberg, and others, all took part in the program. In the 1970’s, thinkers like Gerard K. O’Neill began to formulate ideas of what human colonies in space might look like. NASA held a series of conferences where these ideas were shared and explored. 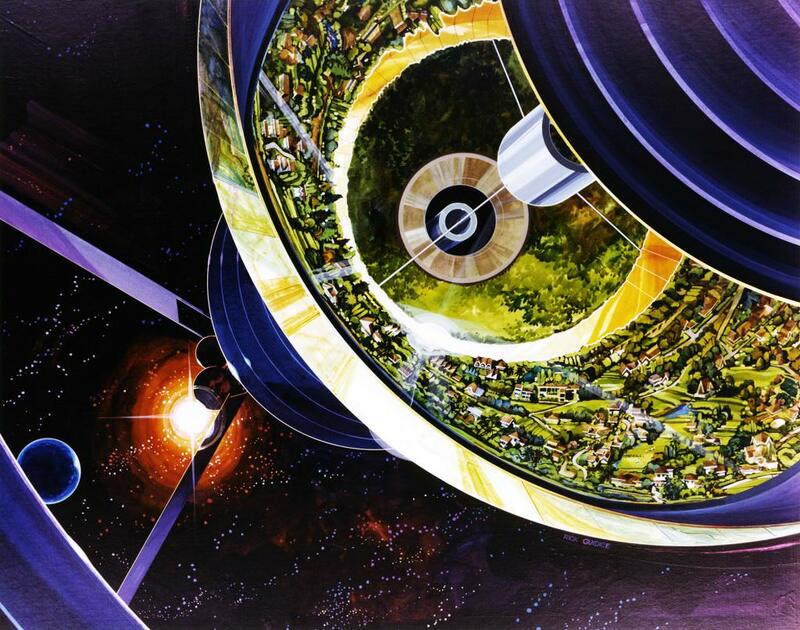 Artists Rick Guidice and Don Davis created many paintings and illustrations of what colony designs like Bernal Spheres, Double Cylinders, and Toroidal Colonies might look like. NASA continues to work with artists, though the nature of the relationship has changed over the decades. Artists are often used to flesh out new discoveries when images are not available. Cassini’s so-called Grand Finale, when it will orbit between Saturn and its rings 22 times before crashing into the planet, was conceptualized by an unnamed artist. The recent discovery of the exoplanets in the TRAPPIST-1 system was huge news. It still is. But TRAPPIST-1 is over 40 light years away, and NASA relied on artists to bring the discovery to life. This illustration was widely used to help us understand what planets orbiting the TRAPPIST-1 Red Dwarf might look like. NASA now has quite a history of relying on art to convey what words can’t do. Space colonies, distant solar systems, and spacecraft ending their missions on other worlds, have all relied on the work of artists. But if I had to choose a favorite, it would probably be the 1981 water color by artist Henry Casselli. It makes you wonder what it’s like for an individual to take part in these species-defining endeavours. Just one person, sitting, contemplating, and preparing.